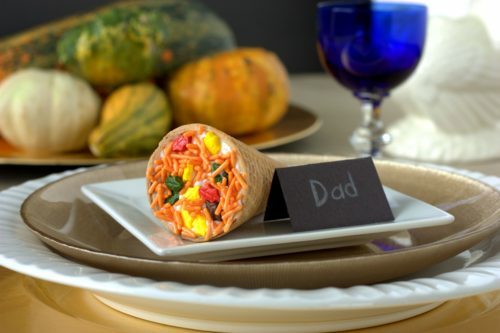 My children are now old enough that they can comprehend the idea of Thanksgiving. So this year I wanted find a fun way to decorate my thanksgiving table while letting all my guests voice their prayers of thanksgiving. 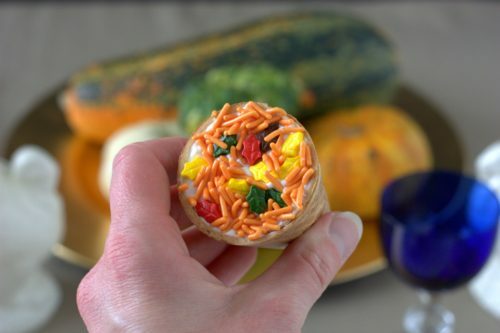 What came to mind was these Cornucopia Gratefulness Cookies which are a take on a fortune cookie. 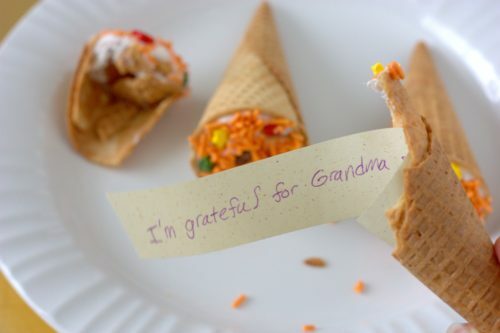 Rather than finding a fortune inside, each cookie has comments from each guest on what they are thankful or grateful for. 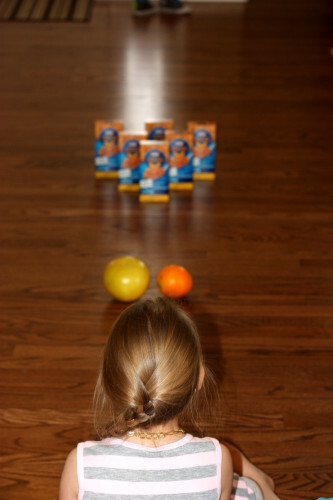 Quotes can be about general items of thanksgiving or specific thanks about each other. Pretty special, right? I can’t think of a better way that to start a meal with those that I love by reading aloud our Thanksgiving praise. Not to mention this easy cookie craft is a colorful way to dress up the table and is super quick to put together. Older kids can even help put them together (I found that my 3 and 5 year old were more interested in eating them than completing the craft on the day I tried this). Collect comments from family and guests ahead of Thanksgiving regarding what they are thankful or grateful for. Write on strips of paper, roll up and place inside sugar cones. Place a bit of frosting around the edge of the vanilla wafer and gently place in the opening of the sugar cone (tucking the paper strip inside) until it fits snuggly. Frost the entire exposed surface of the cookie and then dip into a shallow bowl filled with the fall sprinkles. 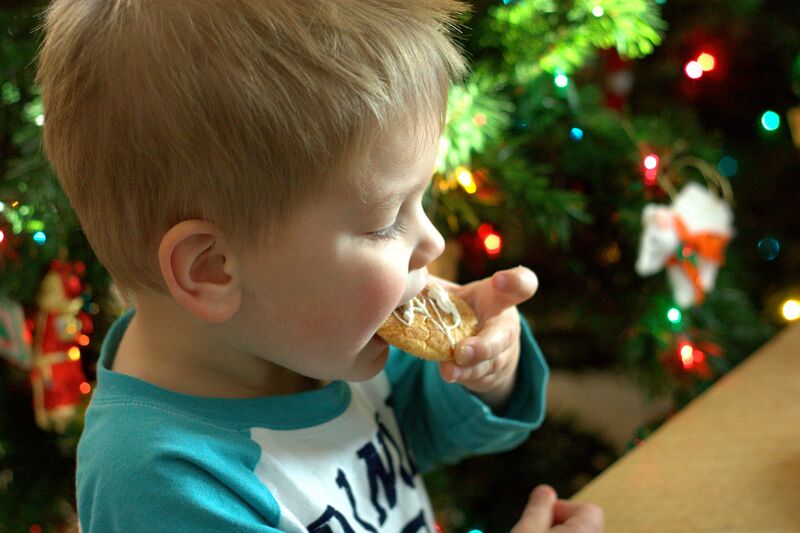 Set aside and repeat with remaining sugar cones and vanilla wafers. 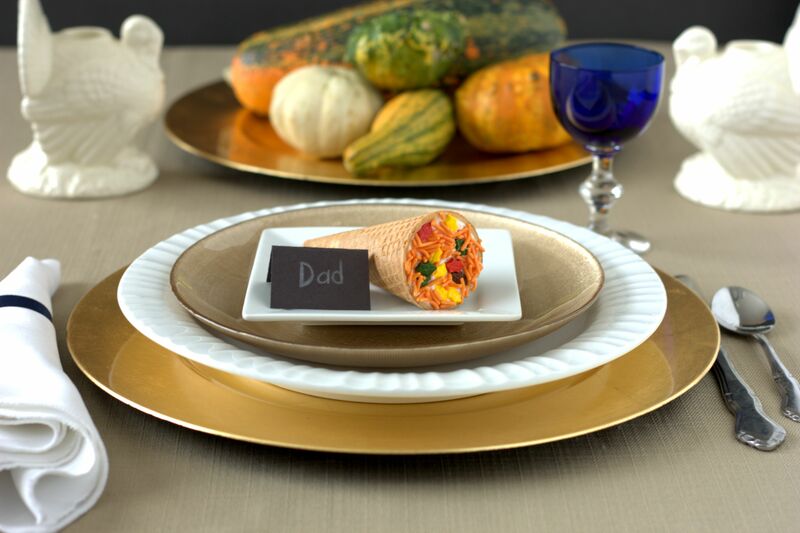 Use as decoration for Thanksgiving place settings and break open cookies to read the notes of thankfulness. 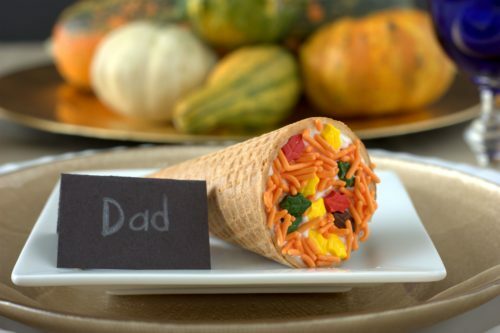 Since my kids are so into crafts I wanted to have them help me make a simple themed dish for Halloween. 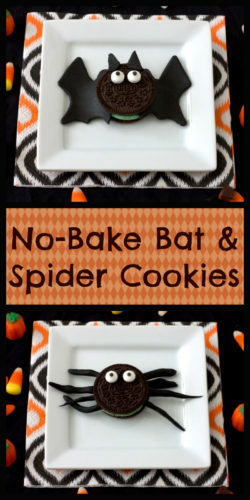 Thus we made No-Bake Bat and Spider Cookies using black fondant and Oreos. 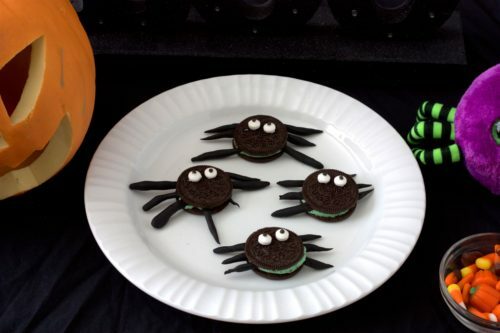 My kids helped make the Spider Cookies which were as simple as rolling log-shaped legs out of the fondant and carefully placing them inside the Oreos. Premade candie eyeballs were affixed to the front for the cuteness factor (as did the uneven leg sizes and odd number of legs per my pint-sized chefs wishes). 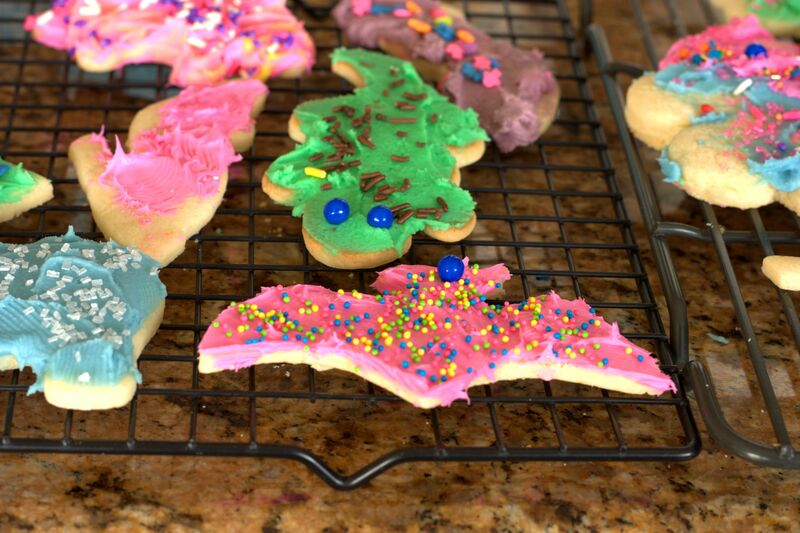 I made Bat Cookies in a similar manner, using a bat shaped cookie cutter to cut wings out of the fondant, though you could use a holly leaf. They were actually pretty easy to put together once I got going, which is a plus when you have a lot of tasks to accomplish for a themed party. 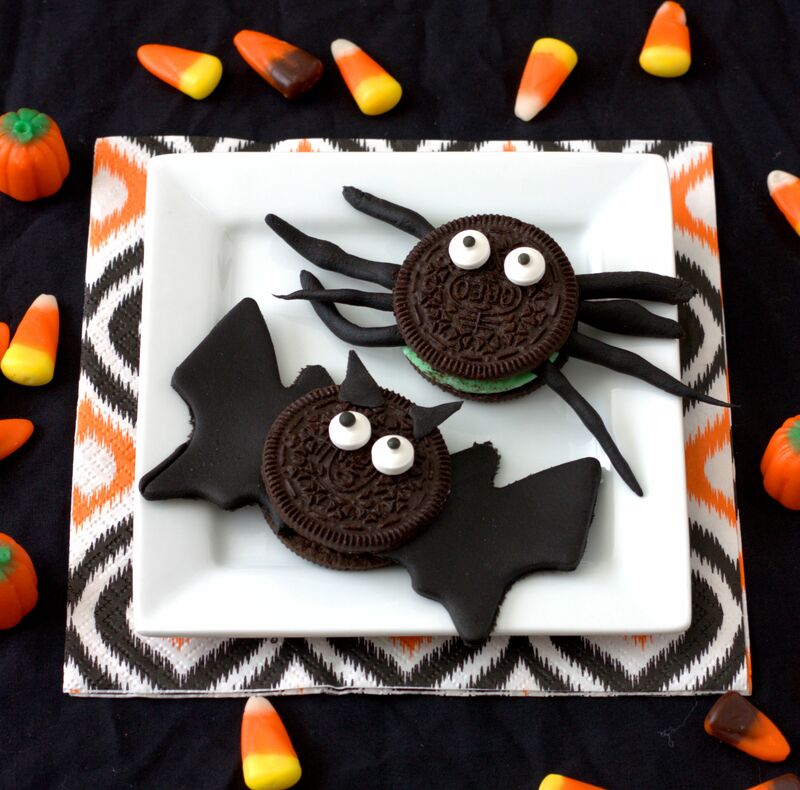 I can also see adding more detail with extra supplies – white fondant to make vampire bats, or red fondant to turn the simple spiders into black widows. I’m sure the kids and I will be making other themed no-bake cookies in the future since we all had such a great time making these treats. 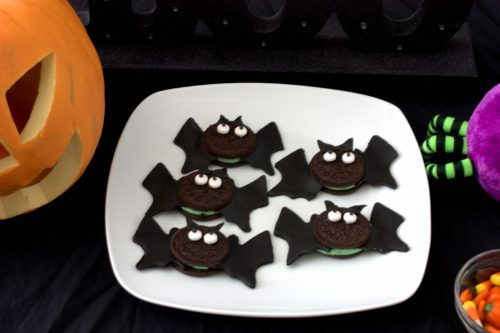 Bat Cookies: Working with one package of fondant at a time, cut of about 1 ounce, rewrap the remainder of the fondant and roll out the fondant to about 1/8th inch thick and cut out two bat wings using your cookie cutter. Then using a knife, cut two small triangular ears. Carefully twist apart an oreo and place the inner edge of each wing into the cookie on the frosting. Replace the top cookie half gently, yet pressing down slightly to seal. Next affix the ears to the top of the cookie and then affix two eyes using the frosting as “glue”. Repeat with the remainder of the fondant and cookies until you run out of fondant. 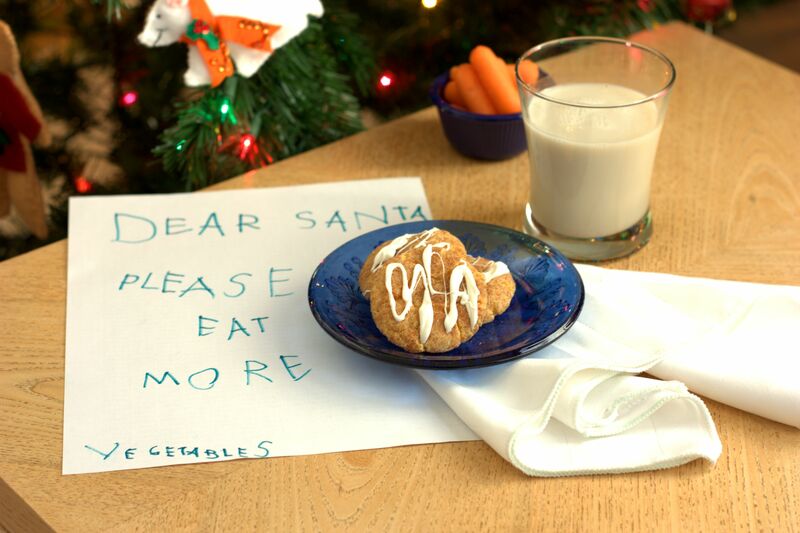 You should get approximately 24 cookies. Spider Cookies: Working with one package of fondant at a time, cut of about 1 ounce, rewrap the remainder of the fondant. Roll the fondant into eight small log-shaped legs. Carefully twist apart an oreo and place four legs on each side of the cookie on the frosting. 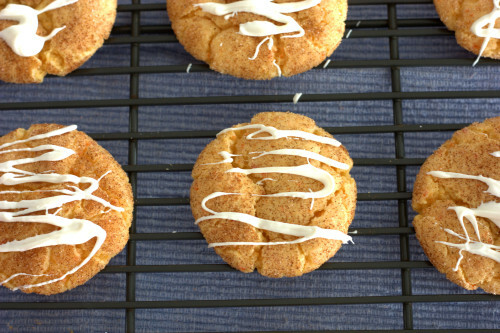 Replace the top cookie half gently, yet pressing down slightly to seal. Next affix two eyes using the frosting as “glue”. Repeat with the remainder of the fondant and cookies until you run out of fondant. You should get approximately 24 cookies. Note: Flatten the end of each leg you place inside the cookie to minimize cracking of the top cookie when it is replaced. 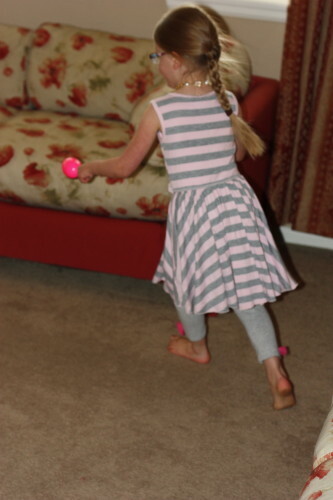 Number of cookies is approximate – as you can see from the photos my kids had a wide size range in the legs they crafted. 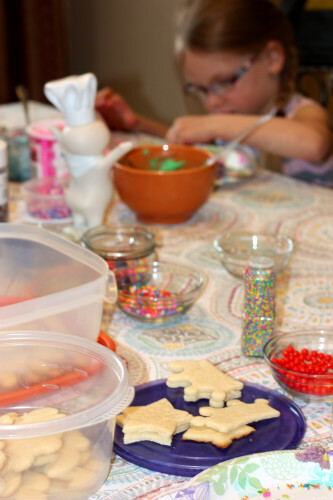 The idea for my daughter’s birthday party this year started with an annual Christmas party we attend, which happens to be a sugar cookie decorating party. My daughter sat for an hour coloring cookies, which made me think that a cooking themed party could be fun since she is always wanting to play sous chef. I built the party around decorating sugar cookies – I baked 5 dozen sugar cookies cut in princess castles, hearts, alligators, and other random animal shapes to please the crowd of Pre-K attendees. 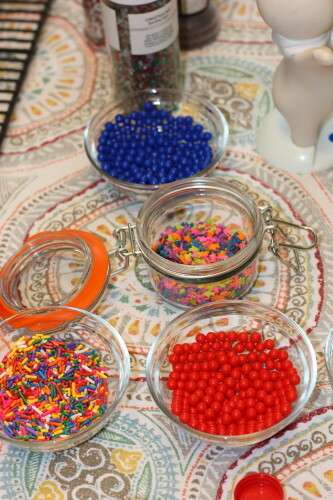 I had bowls of frosting in a variety of colors, and an impressive assortment of sprinkles, colored sugar, and nonpariels. Despite my son immediately claiming the orange bowl of frosting and eating it like a bowl of cereal, it was a success and I heard multiple times from the pint sized guests that they were having fun and doing “an awesome job”. I kept lunch casual by serving a taco bar. The only non-themed item was the dessert, which was a chocolate cream pie decorated with a sparkly horse. My daughter wanted a sub-theme of horse/unicorn party, so I thought a tinseled cake topper like this one would be fun. 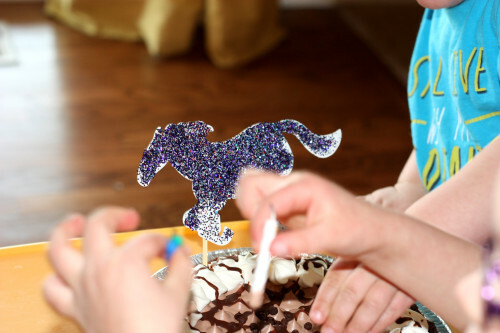 Surprisingly, I couldn’t find a pre-cut glitter figure at my local craft store, so I let my daughter have fun decorating a bunch of plain horses with glitter, which we hung around the house and used for her pie. It probably isn’t a shock to you that weeks later I’m still cleaning up sparkles (and that the cake topper didn’t come out pinterest perfect, but the birthday girl didn’t notice). Tips to the above links: for the cookies, rotate the cookies between the top and bottom rack ~ halfway through cooking and note the comments about real versus imitation vanilla extract for the frosting recipe. I’d also love to hear about your birthday party themes! 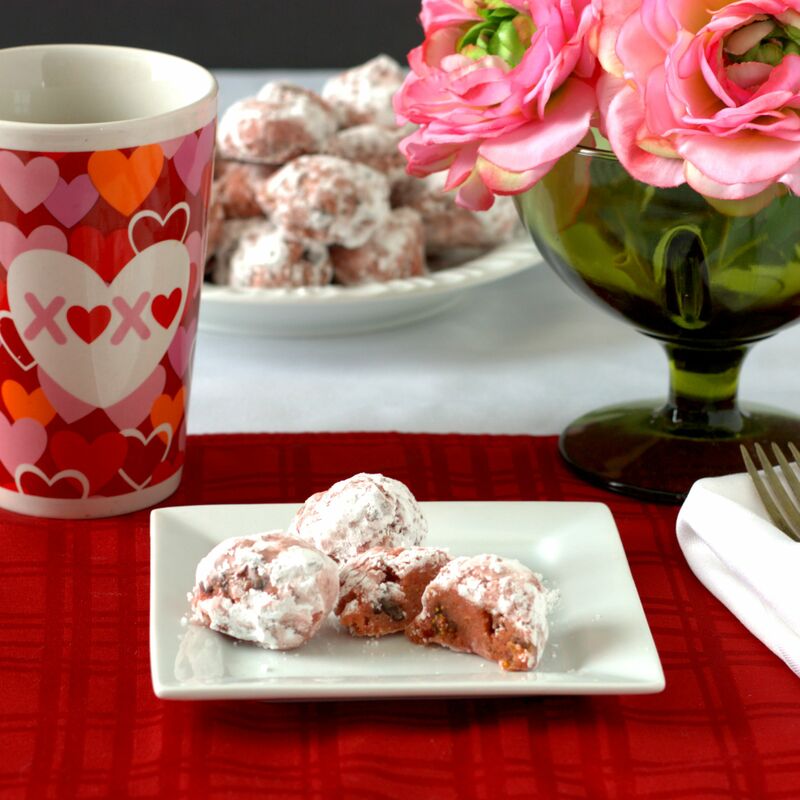 If you like to add a bit of extra flair to your Valentine’s Day meal, these Valentine Brandy Ball Cookies are right up your alley. 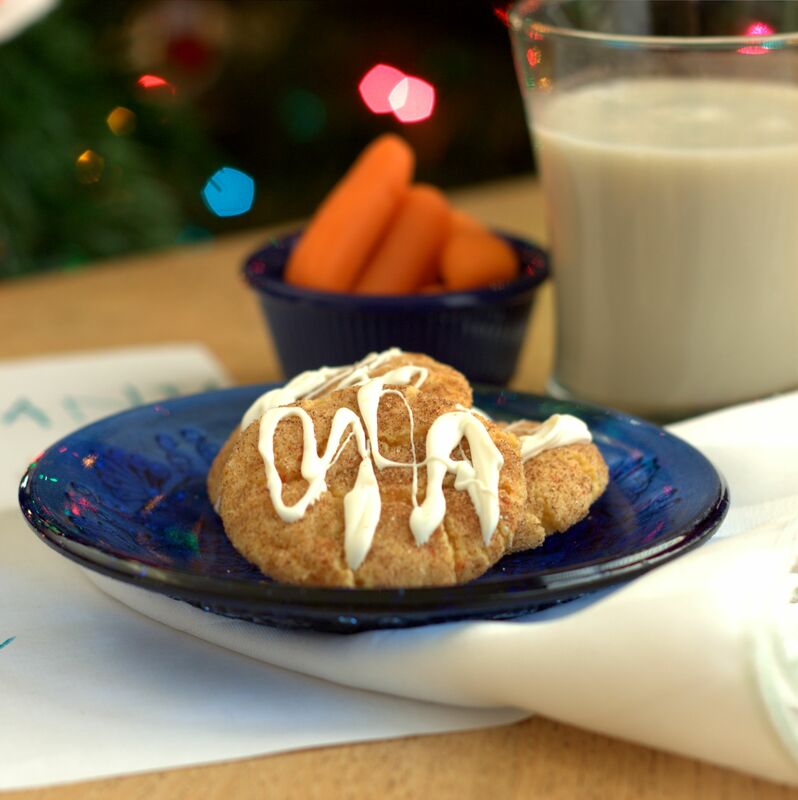 Much like the Christmastime favorite rum balls, these cookies are a no-bake option that are easy to whip up. Simply crush some vanilla wafers, add a few mix-ins, use brandy and corn syrup as binders and roll in powdered sugar – done! 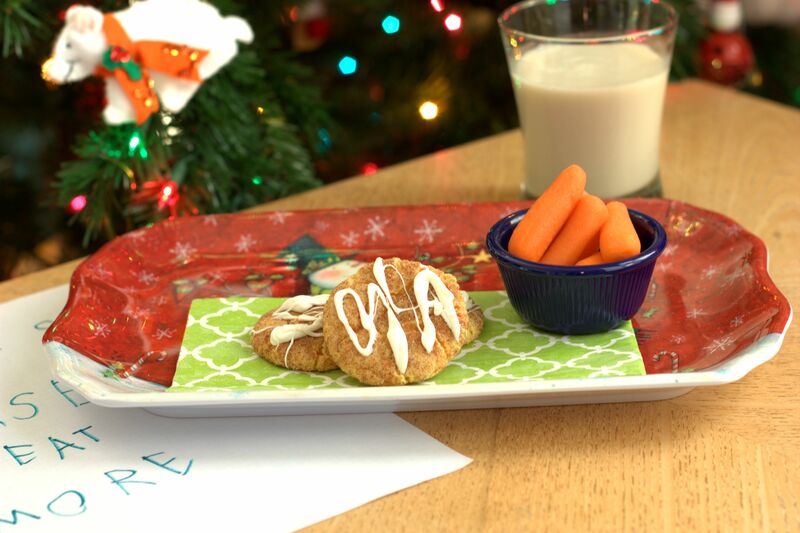 You’ll have made a special treat AND have time to spare to spend with your loved ones. 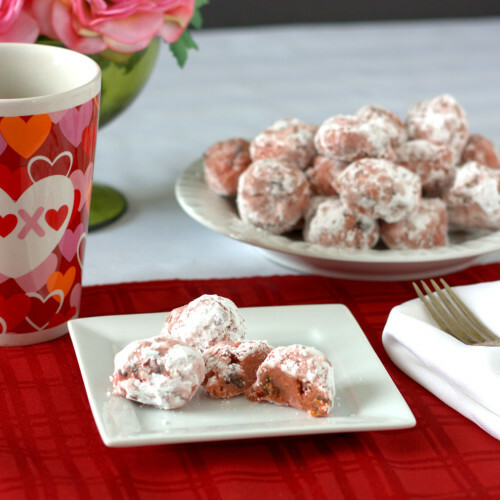 To make these Valentine Brandy Ball Cookies I started with a classic Rum Balls recipe (I chose Emeril’s) and then tweaked it. More specifically, to make these cookies fit for the heart-filled holiday I did two things: (1) made them a pretty shade of pink and (2) incorporated chocolate and figs, which are considered to be aphrodisiacs (it can’t hurt, right? Plus they added great texture). I also swapped the brandy for rum, giving the cookies a flavor similar to a really good fruit cake (and yes there ARE good fruit cakes – I will have to share mine next Christmas). 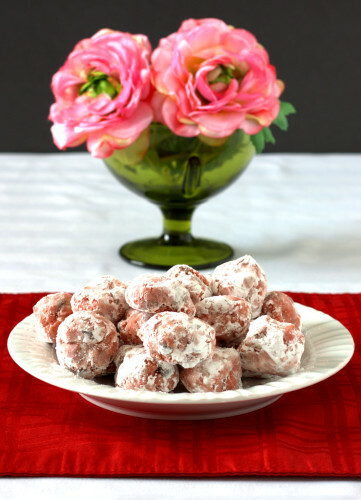 The Valentine Brandy Balls got a nod of approval from my hubby (note: these do pack a fair amount of brandy per cookie and should be considered adults-only) and quickly disappeared from the plate. That means they make the cut for our at-home celebration next week, which will include my Lobster Bisque. With our meal planned, perhaps I should move on to choosing a gift for my love! In a large bowl, mix together the crushed vanilla wafers, chocolate chips, fig pieces, allspice, and one cup of confectioners’ sugar. Pour in the corn syrup and brandy and stir until well mixed. Add the drops of food coloring and mix until the dough turns light pink. Refrigerate dough for at least three hours. Place the remaining 1/2 cup confectioners’ sugar in a shallow bowl or dish. 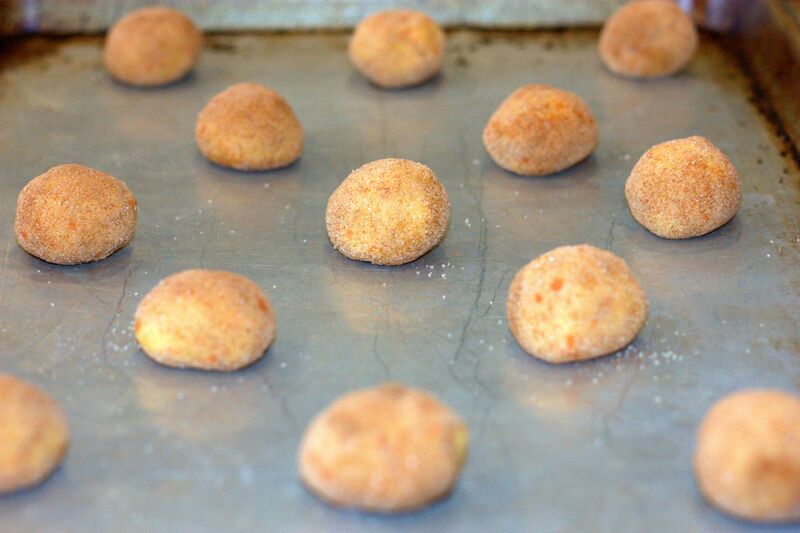 Using a tablespoon, scoop out portions of the cookie mixture and press into 1-inch balls. Roll the cookie balls in the confectioner sugar and place in an air tight container, separating layers of the cookies with wax paper. Store in the refrigerator until ready to eat; makes 24 cookies.